I love how casually chic the Ruffini family is. The way they wear their clothes really exhibits their relaxed nature, it’s so inspiring. The tailoring doesn’t appear too stiff or uptight, letting the cut and proportions hit it just right. If you remember, I first ran into the Ruffini clan back in January 2010. I really like seeing family duos – it’s interesting to see how different generations dress within one family. 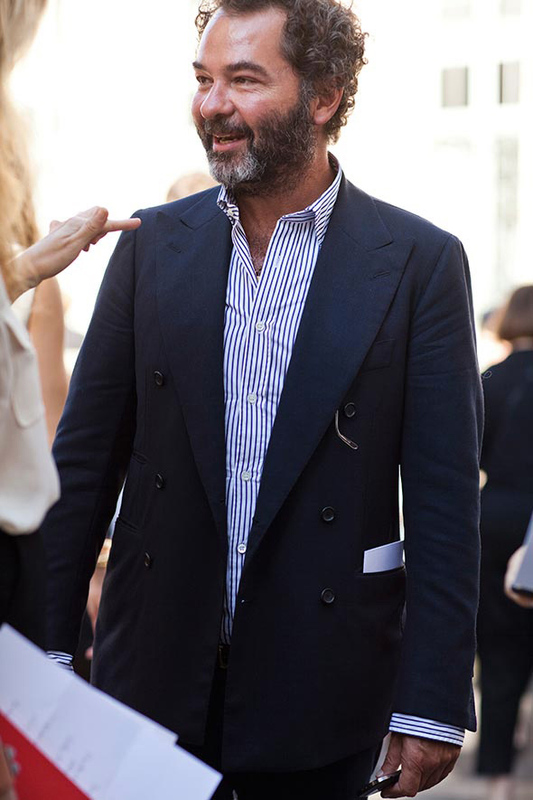 Agreed, great shirt and jacket lengths, which make them look completely effortless. Very attractive. The confidence speaks for itself, its how they wear it that makes it so chic for me. this is the typical true italian style. Its a classic Italian look in both cases. Good looking men, well dressed. What’s not to love? The green shirt is really really cool! This is so interesting that you do lately with the” familias”from many points of view..so true about the length:gives longer legs..
Am I struck with déjà vu, or did you post these exact photos a couple of weeks ago? In any case, love to see the difference and similarities between these two stylish men! After wearing green garmets when I was young, I hated it for so many years due to the military service. Two years ago I resumed buying green . Now it is a must in my wardrobe. So cool. Love that they have the same hair. Hmmm a real treat to see these family shots. I really like the concept. Both father and son exude the same cool factor and yet differ greatly in style. That green shirt is being sold! They both look great! Like the concept of taking portraits of several members of the same family. I agree. Thank goodness, my father passed on to me a real sense of style and knowledge of who clothing should fit one’s body appropriately. Its something I do not see as I shop and see father and sons with no clue on fit and proportions giving instructing one other on the fit of their suits and trousers. What are sales staff for if not for honest critique and guide one to correct choices. Love the wrinkles of both shirts. Yes, relaxed – not sloppy! It is difficult to achieve cool casual looks but Italians know how to do it! amazing, shirt, loved the way he rolled those sleeves! That handsome young man’s name is ROMEO? How utterly perfect. Love it ..the Comparison shots..There fantastic.. They look so much a lie and heir styles are o similar. Its uncanny. Like everyone, I find the family concept very interesting. Look at the way they stand, and the sunglasses peeking out of the pocket. There is really something so cohesive about them, you can see they are father and son. And a very attractive family they are! Their clothing does reflect confidence and comfort. My eyes went straight to their matching sunglasses storage place. The sleeve length on both the blazer and the shirt beneath it seem a good 1-2 inches too long imo. Attractive and stylish duo, the green shirt is one size too small for him (folds from neck show that) but maybe that’s what give him the boyish/fresh look. The style is really Italian, easy to wear, I like it! I like! But didn’t you post this allready, a couple weeks ago? thought you had previously posted these? Amazing both of them! They always look very chic! After my boss returned from Milan a few weeks ago we did a post on Milan families and how relaxed yet coordinated their looks are with one another… your January 2010 photo certainly evokes this style concept, and these recent photos prove how easily one neutral color story dovetails to another. I loooove the leather bracelets! Oh, how absolutely dapper. I adore it. I like how relaxed the younger guy looks. Great photo. The Italians don’t buy as many clothes as Americans. The clothes are closer to the body, break in easily, and aren’t dry cleaned to death. Men in Italy don’t need wives or girlfriends to advise on shopping. It’s also in the details. The basic clothes are subdued, the color blue lives up to it’s lexicon, and attention is given to pocket squares, scarves, shoes(never overly polished, if at all). They don’t spend the kind of money on clothes in Italy as the U.S., because they don’t have to. They live with the comfort and integrity that style is not about fashion or status. Son neither here nor there. Father needs to loose the pot, button the jacket and shorten the shirtsleeves. More sloppy than casual. Neither would merit notice if it weren’t for their name; neither exhibits much of the vaunted Italian style in any case. For that matter, I was surprised and disappointed on a visit to Rome last April after an absence of five years how ordinary most men looked. I’m planning to be in Naples early this coming Spring; I’ll be interested to see how the Neapolitans compare. Romeo makes me proud to have curls too. The way they store their sunglasses is so subtle and interesting. I’m sorry, Sart, they both look very ordinary to me. You would not take their pictures on a street in NYC, or if they didn’t have a fashion pedigree. Ciao gianni sono Remo, lui e’ Romeo, mio figlio, e pensa che ha gia 20 anni ! there is resemblance: take a look at their sunglasses!